Arterial and venous thromboses are considered as distinct conditions, with different pathophysiological substrates1. Meanwhile, embolism may cause both systemic and pulmonary arterial occlusion. Simultaneous systemic and pulmonary embolic events may occasionally be seen in clinical practice. The diagnostic workup of such cases is often challenging. In more than half of cases, pulmonary embolism (PE) is caused by thrombi that originate in the deep venous system of the lower extremities2 and rarely in the pelvic or renal territories, or in the right heart chambers. Systemic embolisms on the other hand mainly arise from cardiac thrombi, frequently associated with atrial fibrillation (AF) or left ventricular aneurysm, cardiac tumors or endocarditis, or from complicated atherosclerotic lesions of the aortic arch3. Concomitant pulmonary and systemic embolic events are often related to paradoxical embolisms occurring in the setting of a patent foramen ovale (PFO) or atrial septal aneurysms4. Recurrence of embolisms despite wellconducted anticoagulant therapy may result from multiple causes, including mobile thrombi in the cardiac chambers, the aortic arch, or in the deep vein system1. We report a notable case of multiple, life-threatening, successive systemic and pulmonary thromboembolic events with multiple possible etiologies. A 78-year-old Caucasian male presented to the Emergency Department for atypical chest pain associated with acute, severe pain and functional impotence of the left upper limb. The onset of symptoms was three days earlier, with rest dyspnea, atypical chest pain, dizziness, cough, and excessive sweating. His medical history revealed arterial hypertension and permanent AF (CHA2DS2-VASc score = 3). The patient was not taking any anticoagulant treatment. Physical examination revealed cyanosis of the left upper limb associated with paresthesia, paralysis and pulselessness at the left brachial, ulnar and radial arteries. The pulse was present at all other usual sites. Cardiac examination revealed tachycardic (90 bpm), irregular heartbeats. The blood pressure at the right upper limb was 145/100 mmHg. Ventilatory rate was 28 breaths/min, with an O2 saturation of 80% that rose to 90% when O2 was administered via simple O2 mask; lung auscultation was normal. 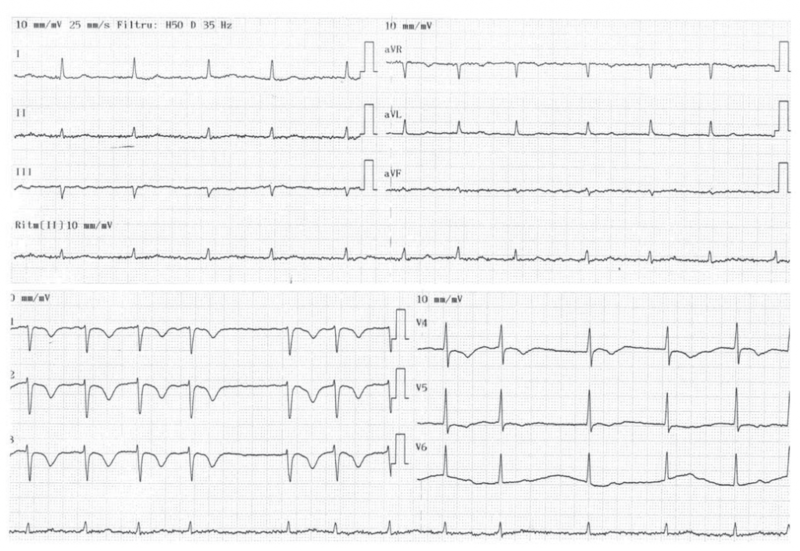 The ECG revealed AF with negative T waves in leads V1-V5 (Figure 1). Blood gases analysis showed hypoxia with normocapnia and mild respiratory alkalosis (pH 7.51). D-dimer test was positive and troponin I was slightly elevated (0.036 ng/mL). Computed tomographic (CT) angiography of the chest, abdomen, pelvis and left upper limb showed the presence of large emboli in both right and left pulmonary arteries (Figure 2A) and total occlusion of the left subclavian artery (Figure 2B), without any other abnormalities. Figure 1. ECG tracing showing atrial fibrillation and negative T waves in leads V1 to V5. Figure 2. Computed tomographic angiography images of the chest showing (A) large emboli in both right and left pulmonary arteries (arrows) and (B) total occlusion of the left subclavian artery (arrow). Given the double systemic and pulmonary embolic event, the patient was started on intravenous unfractionated heparin. Since the patient was hemodynamically stable and presented severe limb ischemia with recent onset and viable limb, emergent embolectomy by transbrachial approach, using the Fogarty catheter, was performed. Heparin was continued postoperatively and the patient was admitted to the Cardiology Department. Complete blood count, renal and liver function and electrolyte balance showed no significant abnormalities. Tumor markers including the prostate-specific antigen, the cancer antigen 19-9 and the carcinoembryonic antigen were within normal limits. Transthoracic echocardiography revealed a non-dilated left ventricle with mild impairment of the ejection fraction (45%), mild aortic regurgitation and moderately enlarged right ventricle (Figure 3). The right ventricle displayed moderately impaired systolic function that spared the right ventricular apex. There was moderate tricuspid regurgitation and systolic pulmonary artery pressure was 60 mmHg. Color Doppler imaging revealed the presence of a PFO (Figure 4A), confirmed by contrast echocardiography (Figure 4B). Doppler ultrasonography of the lower limbs was scheduled 48 h later. After initially stable clinical evolution, 32 h later, the patient presented sudden onset right hemiparesis and mixed aphasia. 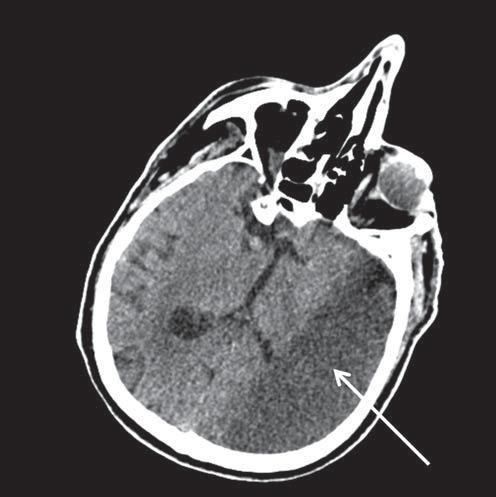 Cranial CT scan at the onset of symptoms, repeated 72 h later, confirmed the presence of a large left-sided ischemic stroke (Figure 5). The patient was transferred to the Neurology Department. Doppler ultrasound examination of the carotid and vertebral arteries revealed a 30% stenosis at the origin of the right internal carotid artery and total occlusion of the left internal carotid artery. The patient was discharged two weeks after the cerebral event on oral anticoagulation, aspirin, rate control for AF, and antihypertensive treatment. By the time of discharge the patient was hemodynamically stable, did not require O2 therapy, the left upper limb was fully recovered, but there was no improvement of his right hemiparesis and mixed aphasia. Follow-up at three months revealed no other thrombotic events, but there was still no improvement of his neurological sequelae. Patients presenting with multiple embolic events are rather commonly seen in clinical practice, but the diagnostic workup is always challenging in such cases. Our patient presented with acute ischemia of the left upper limb associated with intermediate risk pulmonary embolism probably dating for three days, complicated by ischemic stroke two days after hospital admission. Several mechanisms may be taken into account to explain these successive thrombotic events. The association between PE and deep vein thrombosis (DVT) is well established, the two sharing the same risk factors, including immobility, older age, history of smoking, malignancy, thrombophilia, or postoperative states5. Figure 3. 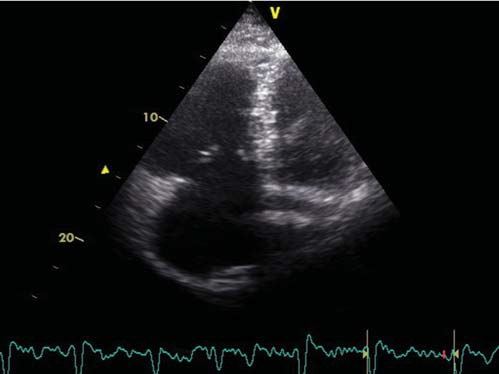 Transthoracic echocardiographic B-mode image in apical view showing moderately dilated right ventricle. Doppler ultrasound evaluation of the lower limbs was not performed during hospital stay in our patient, because of the acute, severe neurological event. Although there were no clinical signs of DVT, its presence cannot be ruled out, knowing that clinically apparent DVT is only present in up to 11% of PE cases6,7. On the other hand, in the setting of PE, the source of emboli is often never identified because of thrombus dislodgement in the pulmonary circulation, so that the remaining is too small to be detected8. Therefore, the lack of detection of DVT does not necessarily rule out this condition as cause of PE. Additionally, DVT could also have been the source for systemic embolism. This hypothesis is supported by the finding of a PFO on echocardiography. A PFO can be identified in up to 25% of the adult population and can serve as a route for paradoxical embolization. The presence of a PFO has been incriminated in the occurrence of cryptogenic strokes among young patients, but its role in elderly individuals remains unclear4. In patients with intermediate-risk PE, the presence of PFO has been associated with an increased risk of ischemic strokes9. Although PFO-related paradoxical embolization usually causes strokes or peripheral ischemia, coronary, renal or splenic ischemic events have also been reported. A PE can be demonstrated in up to 85% of diagnosed cases of paradoxical embolism10. A thrombus trapped in the PFO may also explain the occurrence of ischemic stroke during anticoagulation therapy in our patient11. Thus, direct concomitant embolization originating from a DVT into the pulmonary and systemic circulations, through the PFO, may be responsible for the occurrence of both pulmonary and systemic embolic events. Alternatively, the increased right atrial pressure secondary to the PE, which anamnestically preceded the systemic embolic events, may have promoted the opening of the PFO, setting the route for subsequent paradoxical embolization and systemic embolic events. One should not forget, however, that the patient had permanent AF with an important embolic risk according to the CHA2DS2-VASc score and no anticoagulation. While AF-related left atrial thrombosis could have caused acute limb ischemia and stroke, right atrial thrombosis may have caused PE12. Indeed, AF is generally accepted as an independent predictor for systemic embolism13, most AF-related systemic embolic events being cerebral (85% of cases) and less peripheral (15%)14. Even after initiation of anticoagulant treatment, the risk of embolization remains high for a few days. Figure 4. Transthoracic (A) color Doppler image in subcostal view and (B) contrast echocardiographic image in apical view showing a patent foramen ovale with right-to-left shunt. Note the presence of contrast echoes, depicted as white pixels, in both the right and left ventricles (arrows). Figure 5. Computed tomography image of the brain showing left-sided ischemic stroke (arrow). On the other hand, the relationship between AF and PE remains controversial, but anatomopathological studies suggest that right atrial thrombosis might have a similar role for the development of PE as left atrial thrombosis for systemic embolism. A recent autopsy-based study demonstrated that right intracardiac thrombosis is as common as left intracardiac thrombosis8. However, due to inaccessibility of the right heart to non-invasive diagnostic techniques, largescale in vivo studies assessing the prevalence of right atrial thrombosis among AF patients and the associated PE risk are still lacking. Finally, the multiple systemic and pulmonary embolic events in our patient may have been fully independent. Whereas a DVT could have been responsible for the PE, the double systemic embolic event may have been caused by dislocation of left atrial thrombi in the setting of permanent AF or by embolization from arterial sources. This report illustrates a case of multiple, life-threatening, successive systemic and pulmonary thromboembolic events with multiple possible etiologies. The coexistence of multiple conditions known for their prothrombotic potential makes it impossible to establish with certainty an etiologic diagnosis. Whereas AF and arterial atherosclerotic lesions, and DVT are widely accepted risk factors for systemic and pulmonary embolisms, respectively, further studies will have to establish the relationship between AF-related right atrial thrombosis and PE. Funding: Alina Scridon was supported by the Sectoral Operational Programme Human Resources Development (SOP HRD), financed from the European Social Fund and by the Romanian Government under the contract number POSDRU/159/1.5/S/133377. 1. Lowe GD. Common risk factors for both arterial and venous thrombosis. Br J Haematol 2008; 140: 488-95. 2. Kostadima E, Zakynthinos E. Pulmonary embolism: pathophysiology, diagnosis, treatment. Hellenic J Cardiol 2007; 48: 94-107. 3. Iuliano L, Misuraca M, Varroni A, Raponi M, Massucci M, Pagnanelli A, Cimino G, Bertoletti G. Multiple thromboembolism with multiple causes in a 69-year-old woman: a case report. J Med Case Rep 2011; 5: 186. 4. Homma S, Sacco RL. Patent foramen ovale and stroke. Circulation 2005; 112: 1063-72. 5. Heit JA, Silverstein MD, Mohr DN, Petterson TM, O’Fallon WM, Melton LJ, 3rd. Risk factors for deep vein thrombosis and pulmonary embolism: a population-based case-control study. Arch Intern Med 2000; 160: 809-15. 6. Koutkia P, Wachtel TJ. Pulmonary embolism presenting as syncope: case report and review of the literature. Heart Lung 1999; 28: 342-7. 7. Demircan A, Aygencel G, Keles A, Ozsoylar O, Bildik F. Pulmonary embolism presenting as syncope: a case report. Journal of Medical Case Reports 2009; 3: 7440. 8. Ogren M, Bergqvist D, Eriksson H, Lindblad B, Sternby NH. Prevalence and risk of pulmonary embolism in patients with intracardiac thrombosis: a population-based study of 23 796 consecutive autopsies. Eur Heart J 2005; 26: 1108-14. 9. Doyen D, Castellani M, Moceri P, Chiche O, Lazdunski R, Bertora D, Cerboni P, Chaussade C, Ferrari E. Patent foramen ovale and stroke in intermediate-risk pulmonary embolism. Chest 2014; 146: 967-73. 10. Hausmann D, Mügge A, Daniel WG. Identifi cation of patent foramen ovale permitting paradoxic embolism. J Am Coll Cardiol 1995; 26: 1030-8. 11. Mateescu AD, Antonini-Canterin F, Nicolosi GL. Impending paradoxical embolism in a patient with recent abortion. Romanian Journal of Cardiology 2014; 2: 6670. 12. Torbicki A, Galié N, Covezzoli A, Rossi E, De Rosa M, Goldhaber SZ; ICOPER Study Group. Right heart thrombi in pulmonary embolism. J Am Coll Cardiol 2003; 41: 2245-51. 13. Wolf PA, Abbott RD, Kannel WB. Atrial fi brillation as an independent risk factor for stroke: the Framingham Study. Stroke 1991; 22: 983-8. 14. Cabin HS, Clubb KS, Hall C, Perlmutter RA, Feinstein AR. Risk for systemic embolization of atrial fi brillation without mitral stenosis. Am J Cardiol 1990; 65: 1112-6.